Crystal grids are made by placing crystals in a particular pattern to act as an energy-producing matrix. They are a wonderful means for generating, amplifying, and focusing forces, and can be set up permanently or for certain occasions. Having an open mind and not being attached to outcomes is important. 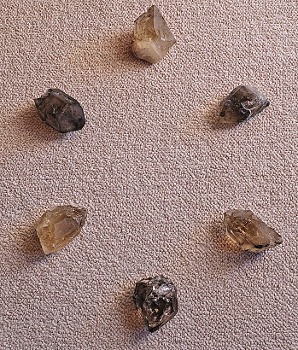 Selection of crystals for a grid is often based on intention. For example, elestials and smoky quartz are particularly attuned to Earth energies. Citrine is useful for mental clarity. Amethyst helps in bringing together disparate ideas and approaches. Rock crystal (clear quartz) is excellent for expanding perspectives and seeing clearly what needs to be done. I generally use double-terminated (DT) crystals if possible, as their energy will move into and out of the grid from all directions. Self-standing ones work well for attuning with the cosmos, and bringing those forces down into the Earth. One of the best grids is the six-pointed star, two interlaced triangles representing the interpenetration of Earth and sky energies. Another is constructed by placing crystals at the four cardinal points. A compass can be used to determine the exact positions. Additional crystals can then be added at the midpoints, creating an octagon. A 12-crystal grid adds two between each of the ones at the cardinal points. It is also possible to create a complete circle by placing the crystals end-to-end. Grids can be constructed indoors, and you can sit in the center during meditation. Larger-spaced ones can be used for group attunements and meetings. Smaller grids can be used to charge other crystals — I have experienced a huge increase in a crystal's energy after placing it in a grid for a few days, or even leaving it in there permanently, only taking it out for various uses such as meditation or healing. In this case, I recommend holding it under cool running water for a short time before placing it again in the grid. I have used grids for many purposes. For example, five self-standing rock crystals are underneath our bed. It seems to help create a sense of peace and stillness, very helpful since that is also where we meditate. 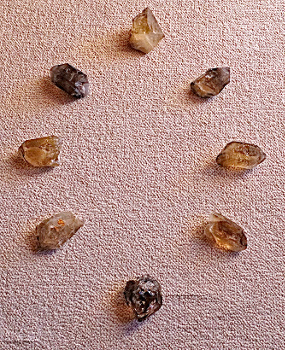 In our medicine circle, the outer ring consists of 12 DT rock crystals, with points facing outward and inward. About three feet inside this ring is a circle of four large DTs at the cardinal points and smaller ones at the midpoints. All are placed similarly to the outer ring, and locally found rocks fill in the spaces between each. In the center is a large DT with its bottom buried in the ground and top pointing skyward. Surrounding this is a circle with medium-sized smoky elestials at the cardinal points, and 12 smaller rock DTs placed point-to-point filling in the spaces. The circle is used for individual and small group attunements and meditations, and full moon, equinox, and solstice celebrations. I also place newly-purchased crystals inside it for charging with solar, lunar, and nature energies. This definitely increases their ability to generate peace and harmony, and facilitate healing. Crystal grids are easy to make and fun to play with, using crystals you already have. Be willing to experiment. Try using different crystals and/or changing their grid positions. If using single-terminated, try with points facing in, and then turn them around. Also vary the distances between the crystals. Don't be attached to immediate results — it may take some time to feel the energy shifts.